YORK HAVEN, Pa.: Chase Gutsall remembers going to Williams Grove Speedway to watch his idols in the Super Sportsman division. At the time, Gutshall raced in the micro and quarter-midget division. But he always dreamed of running a Super Sportsman and outrunning his fellow drivers to the checkered flag for a win. And now, Gutshall is one of the group. 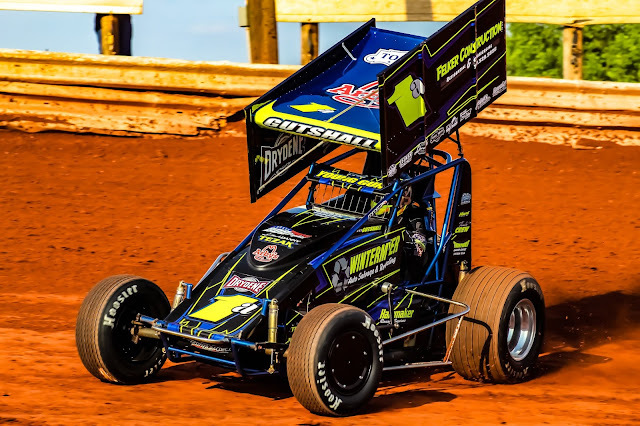 Gutshall, a 17-year-old up-and-comer, showed how far he has come in his second full year of Super Sportsman competition, when he held off the division’s best, Scott Dellinger to win the 25-lap BAPS Paint Night main event at BAPS Motor Speedway. “It was pretty special,” said Gutshall of his first career victory. “I was there at Williams Grove watching all of my idols, Scott Dellinger, Frankie Herr, Kenny Edkin, and Russ Mitten. I’m pretty honored to be running up front with them. Adam Wray got the jump on the start from his pole-starting spot and paced the field, with Gutshall surging into second. Gutshall followed Wray for the first three circuits before making a bid for the lead on Lap 4. Before Gutshall could pull the trigger and make the pass, the caution was displayed, and a restart ensued. Wray had little chance. Gutshall got a good start and nailed the bottom in Turns 1 and 2, driving into the lead off the second corner. No lead is safe with Scott Dellinger, who has six wins on the season at the speedway, lurking in the field. Dellinger started 10th on the grid and, methodically, made his way to the front. He diced with Frankie Herr in the top five before taking over the second position. But Dellinger didn’t have to run down Gutshall very long. A caution on Lap 13 gave the track kingpin a clear shot at the leader. Gutshall wasn’t worried. He kept his nerves in check and was able to hang on over the last 12 laps to earn a well-deserved trip to Victory Lane. “I kept looking at the scoreboard and saw Scott Dellinger was behind me,” Gutshall said. “So, I knew I needed to step up my game on the restarts. Dellinger was second, followed by Herr and 11th-place starter Chad Criswell. Justin Foster stormed from 18th to fifth and was named Aero Wings Hard Charger. Nate Young received the ArtWerks Hard Luck Award. Wray, Gutshall, and Criswell were heat winners for the 28-car field. Foster won the consolation. It wasn’t exactly easy for Potts at the front. Six cautions gave Brian Shuey and Alan Sagi plenty of opportunities to wrestle the lead away. But Potts was up to the challenge. He controlled the front position and took the win over Sagi, Shuey, Sean Merkel, and Joe Lusk. Potts, Shuey, and Travis Mease were heat winners for the 21-car field. In the 20-lap Morgan Paving-Aqua Fun Pools Street Stock division, it was all Jason Townsend at the front for the win. Townsend lined up fourth on the grid but took the lead on a wild first lap. That was all he needed to lead the rest of the way and take the win. Jasen Geesaman came from eighth to second. Eric Tripp also made a nice charge to third after starting in the 11th position. Brian Walls and Ryan Smith completed the top five. Townsend, Smith, and Walls were heat winners for the 21-car field. Trip received ArtWerks Hard Charger honors. Super Sportsman Feature Finish, 25 Laps: 1. Chase Gutshall; 2. Scott Dellinger; 3. Frankie Herr; 4. Chad Criswell; 5. Justin Foster; 6. Kenny Edkin; 7. Steve Fannasy; 8. Bruce Buckwalter; 9. John Edkin; 10. Garrett Williamson; 11. Dave Hollar; 12. Tyler Wolford; 13. Timmie Barrick; 14. Jay Fannasy; 15. Doug Dodson; 16. Matt Ondek; 17. Tom Wyckoff; 18. Mike Enders; 19. Dan John; 20. Adam Wray; 21. Davey Walsh; 22. Russ Mitten; 23. Paul Miller; 24. Nate Young. Late Model Feature Finish, 20 Laps: 1. Charles Potts; 2. Alan Sagi; 3. Brian Shuey; 4. Sean Merkel; 5. Joe Lusk; 6. Travis Mease; 7. Chuck Cox; 8. Ross Leinbach; 9. Brandon Eveler; 10. Troy Miller; 11. Ben Whitaker; 12. Cameron Benyou; 13. Dave Latsha; 14. Joe Westerman Jr.; 15. Terry Gingerich; 16. Shaun Miller; 17. Deshawn Gingerich; 18. Jennifer Hartz; 19. Bobby Beard. Street Stock Feature Finish, 20 Laps: 1. Jason Townsend; 2. Jasen Geesaman; 3. Eric Tripp; 4. Brian Walls; 5. Ryan Smith; 6. Eddie Richards; 7. Jim Palm; 8. Wayne Dutterer; 9. Brandon Wanner; 10. Bobby Kupp; 11. Kory Sites; 12. Kevin Kolaric; 13. Bud Witmer; 14. Bill Wentz; 15. Gary Calimer Jr.; 16. Marshall McMullen; 17. Chris Derr; 18. Cory Phillips; 19. Randy Zechman; 20. Kyle Saylor.